It's taken me a while to figure out a meal plan system that works well for me. For many years, I've kept a list of all my greatest hit recipes to refer to when planning the next week's meals, but I always agonized over what to choose that week (Didn't I just make tostadas? Is that too much chicken in one week?) and often ended up forgetting an ingredient (because sometimes I'd forget to check the ingredient list for each recipe before going to the store) or tossing out a perishable ingredient that didn't get used up. 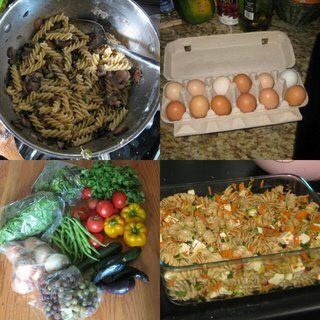 Then I created a 2-month plan, broken into 7-meal cycles and their accompanying shopping lists. Each 7-meal cycle was supposed to last me about 10 days, which was how often I envisioned going to the grocery store now that we live a bit farther from my true love Trader Joe's. This was a great plan in theory because it ensured that I rotated through all of my meals, repeated the favorites a few times before rotating in a not-so-favorite, and planned all the meals that needed bacon or basil the same week so that all the perishable ingredients got used up. My first attempt at systematic meal planning. It didn't work for me. But it didn't work out. Because sometimes I didn't feel like having the 7 meals that were slated for the upcoming period. And sometimes I wanted to cook based on what was at the Farmer's Market. Sure I could substitute, but that threw off the whole rotational common-ingredients scheme. It also screwed up the shopping lists. The 10-day shopping period didn't work out very well either, because sometimes we ran out of milk or had some other life-threatening grocery emergency before the 10 days were up. So here's my new system. I have a list of all my recipes organized by category with columns for each week (see above). My categories are Ground Turkey (we nixed ground beef long ago, and have since nixed beef completely), Chicken Thighs (I buy organic chicken thighs instead of conventional breasts -- they cost about the same), Other Chicken (drumsticks, whole chicken), Tofu, Beans, Other (mostly vegetarian). I put a dot in the appropriate box when I am planning to make the meal and creating my shopping list, and then write the day of the week (or a check) when I actually make the meal in the box later (this facilitates using up oldest leftovers first). With this chart I can easily visualize when I last made a meal. The chart also helps me easily plan a 50% meatless menu: we eat about 2 vegetarian meals (from the tofu, bean or other categories) for every 2 meaty meals (usually one ground turkey and one chicken). The accompanying shopping list guide (see above) has the meals in the same order, just so they are easy for me to find. It lists the ingredients according to Shopping List (perishables) and Pantry Items -- a simple yet ingenious idea I got from Life as Mom. This guide also helps me to know which meals use basil as well as which meals I can make with just the ingredients in my pantry should I find myself in a pickle. This system is working out splendidly. It is somewhat structured, but also flexible. Occasionally I make a recipe that is not in the regular rotation, and sometimes I throw in a completely new recipe. And it all works out fine. Stay tuned for future recipe posts (including Meatless Monday posts) , when I'll be featuring our favorite meatless recipes from my meal plan. Hee, I had to read very concentrated to keep track! But I guess it's not as bureaucratic as it seems ;) It's great how you've found a system that works for you! I let my weekly loot of organic CSA vegetables decide what we're going to eat and just scribble down the menu on a scrap of paper that's posted to the refrigerator door. Sometimes I designate a day. And once we've eaten a dish it gets crossed off. Such a long comment and I still forgot something... LOL You've got some interesting dishes on your fav list! I'm really interested in (veggie) recipes like the black bean burgers, lentil-cheese loaf, curry tofu stir-fry and zucchini quesadilla. I'll have to keep an eye on your blog! I only shop every two weeks and I base it on what's in our CSA but I do have to run to the store btw for milk and bananas). I do like your system though! Thanks for commenting on how you meal plan gnoegnoe and Shannon. I used to try to find recipes to go with what was at the Farmer's Market or on sale at the grocery store -- there are SO many recipes on the Internet, it was just way too time consuming. And I really hate spending the time to prepare and cook a new meal only to have it turn out poorly or even so-so. Sometimes my husband says, can we just have the regulars for a while and no experimenting? So we have a limited capacity for that kind of thing. Thus, the meal plan of tried-and-true meals. I like your way of meal planning! Organized, but not too structured. I have gone off again on again with different meal planning techniques. Right now, I have no plan...I just try to keep it simple. Bravo. Meal planning is my next frontier in home organization but for some reason it seems so daunting every time I start to sit down and plan. However, staring into the fridge at 4:30 and realizing almost everything is either frozen or inedible because I forgot about it is pretty daunting, too! Wow, that is such a great idea. I like that you can cross reference ingredients, like basil (when you get a ton in your CSA). Do you keep track of it by hand, or do you sort it in a database on Excel? Mara, since i have the ingredients listed all together, I cannot sort by "basil" -- mostly, I just glance down the column "Shopping List" -- I am probably going to highlight all the basil one color, all the bacon another color, etc. Thanks for sharing your new system. I love seeing how other people do it..there is always room for improvement in that department for me! I cannot sort by "basil," but I can search for "basil" in Excel, and that works the same way as searching for a word in a Word Doc. Not as easy as sorting. Sigh...I love Excel! I generally use the paper/pencil method, but I also have a subscription to plantoeat.com. Plantoeat is nice and you can import recipes from many websites or copy and paste in ingredients, but I go back on forth about whether or not it's really easier.